News: John Krasinski will be a presenter at the MTV Movie Awards on June 3rd. News: Rainn Wilson will be a presenter at the Tony Awards on June 10th at Radio City Music Hall. Article: an argument against TV romances (including Jim and Pam’s). 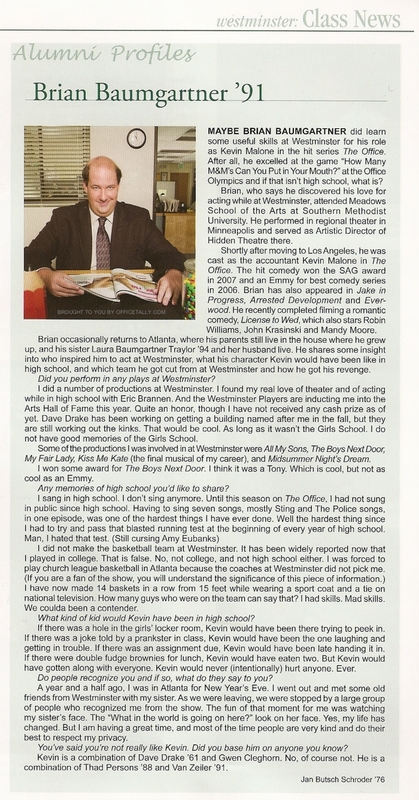 Interview: the Westminster alumni magazine interviews Brian Baumgartner. Video: a clip from Rashida Jones’ Rules For Starting Over. Event: The Office Executive Producers Greg Daniels and Ben Silverman will be interviewed at the Banff World Television Festival on June 11-12. Fan scripts: check out fan scripts The Fridge, The Golf Outing, The Exterminator, and Heat Wave. Live performance: a reminder that Kate Flannery performs in The Lampshades next Saturday and Monday, June 2 and 4. Go see it, it’s a fun show! This is crazy. I *live* in Banff. Nobody even semi-interesting comes here. Finally! John at the movie awards? He is becoming a big star! Hope he never forgets the people who loved him first! That MTV Awards link states that JKras is scheduled to do 6 movies this year…I didn’t realize it was so many! That article about office romance pissed me off. Grouping Jim and Pam and Dwight and Angela in with couples on “Grey’s Anatomy”? Please. That is wrong in so many ways. Yikes. Rashida’s new show doesn’t exactly impress me yet. We’ll see. Those scripts are amazing! The author has a great grip on the canon of the show! Hilarious! ahhhh swoonnnnnnnn “stealth heartthrob” love it. and did you all see pictures from Mean magazine over at GMMR? I totally made one of them my desktop background. it’s so pathetic. Wow. I am very flattered that you posted my site on your tally. Thank you. Seriously…to the author of that MSN article: have a heart! And lighten up, will ya? And I’m glad that the Newsweek article is championing beta males! I’ve always found them way more endearing than alpha dogs. Yeah, that msn article was way off. I mean the guy says this of Jim and Pam: “Clearly, they are not made for each other”. Really? Is he even watching the same show as me? Yes, D.K. Holm, you are the only person in America who doesn’t like Pam as a potential mate for Jim. Also, D.K. Holm, The Office has had romantic and sexual tension as the emotional core of the show since the first season; it’s not new. i just read the article of John Krasinski over at GMMR, and you’d think you couldn’t love him any more, read it. aww these scripts are so cute. YAY Tom and Chris! The scripts are finally getting the attention they deserve. Great job guys! Thanks officetally. I just read that interview out loud to my husband, & we are both so impressed. I hope John remains that unaffected & so deeply kind. He is really beautiful. John Krasinski also had small parts in Dreamgirls, The Holiday, and Duane Hopwood. I’m not obsessed. I’m not sure if anyone has said this yet but its supposed to be MTV Movie Awards, not Music. tmckenna, your scripts are A-W-E (clap, clap) S-O-M-E! i just got done reading all of the fanscripts. i could totally hear everyone’s voice in the words. well done! Question: tmckenna, will you be doing any more scripts?! These are hilarious and would make excellent episodes (especially The Exterminator)!! !